Made with real beef and fortified with vitamins and minerals. An excellent tasty treat for all dogs that can be easily broken into smaller pieces if desired. 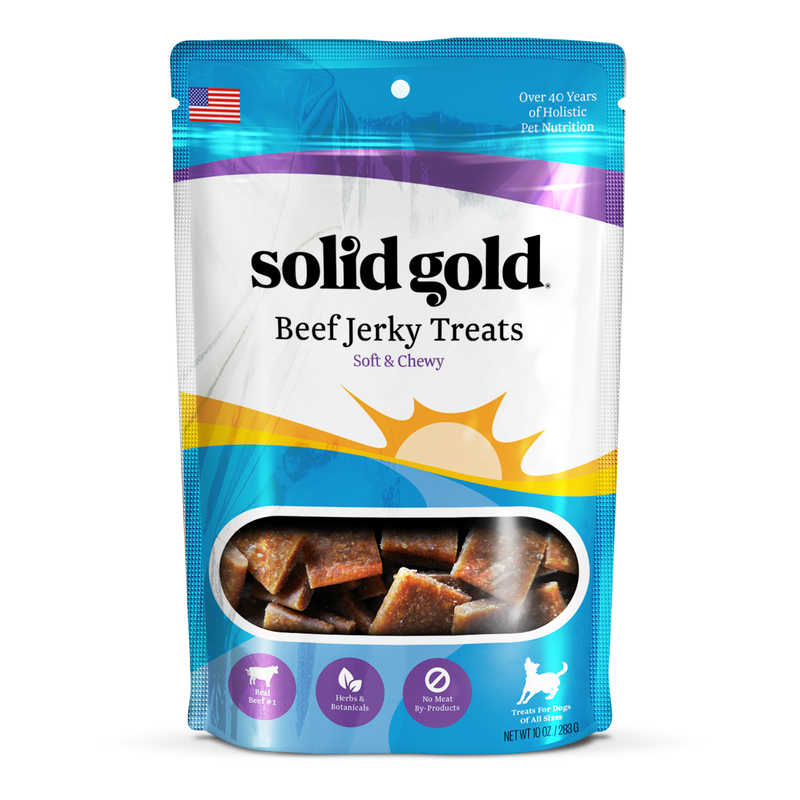 Our Solid Gold Jerky is soft enough for puppies, or for older dogs with dental problems. 2 Benefits: Dogs LOVE them. Soft to chew. Con: They are a bit expensive, but worth it because they have healthy ingredients in them and my dogs love them. Review: My dogs went crazy over these lamb jerky treats! Even my ”picky eater” foster dog loved them. I also liked that they were soft and easy to chew up so even my 10 year old dog could chew them. The dogs especially liked the smell of them and got excited by just opening the bag! I also got a beef flavor as a Christmas gift and they really liked those as much as the lamb flavored treats! You’d think my dogs have died and gone to treat heaven! 2 Benefits: Love the taste. Great size and softness for training treats. Review: The size of these treats are so easy to use, they are easy to break into smaller pieces, easy to carry with you, and they motivate my dogs during our obedience practice (usually use hotdogs, which get slimy and hard to transport to parks, etc..). We gave a bag to a friend with two dogs, and they loved them, too. 2 Benefits: Dogs loved them! Don’t fall apart in your pocket or treat bag. Review: I said I could teach our youngest dog a new trick in one weekend, and using these treats it worked great! She loved them, and the size and texture was perfect to carry without crumbling and to break into smaller bits for training. Older dogs loved them, too, and I’m happy to give them treats that are healthy. Review: My dog Mitzy especially loved it when I put some treats in her Kong. She is an aggressive chewer and loves the game of getting treats out of her Kong. I tried using the treats for training, but being over 6 years old she wasn’t taking to training very well. A co-worker that I gave the extra bag of treats to showed me a picture of her dog balancing a treat on his nose. She said her dog loves the treats. Review: I used them for treats for dog obedience classes, and to work at home. The dogs loved the taste, and was willing to work for them. Also I could break them into smaller bits and the bits didn’t disintegrate.